Clockwise from top: habanero, chipotle and chimichurri. Salsa is often a tomato-based sauce or dip which is heterogeneous and includes additional components such as onions, chilies, beans, corn, and various spices. They are typically piquant, ranging from mild to extremely hot. The word salsa entered the English language from the Spanish salsa ("sauce"), which itself derives from the Latin salsa ("salty"), from sal ("salt"). The native Spanish pronunciation is [ˈsalsa]. In American English it is pronounced /ˈsɑːlsə/, while in British English it is pronounced as /ˈsælsə/. Pico de gallo ("rooster's beak"), also known as el salsa fresca ("fresh sauce"), salsa picada ("chopped sauce"), or salsa mexicana ("Mexican sauce"), is made with raw tomatoes, lime juice, chilies, onions, cilantro leaves, and other coarsely chopped raw ingredients. Salsa cruda, "raw sauce", is an uncooked mixture of chopped tomatoes, onions, jalapeño chilies, and cilantro, or coriander leaf. Salsa negra, "black sauce" is a Mexican sauce made from dried chilies, oil, and garlic. 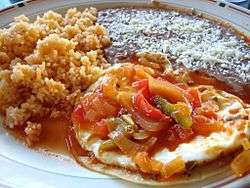 Mole (Spanish pronunciation: [ˈmole]) is a Mexican sauce made from chilies mixed with spices, unsweetened chocolate, almonds, and other ingredients. Chipotle salsa is a smoky, spicy sauce made from smoked jalapeño chilies, tomatoes, garlic and spices. Habanero salsa is an extremely spicy salsa, where the piquancy comes from habanero chilies. Corn salsa is a chunky salsa made with sweetcorn and other ingredients, such as onions, and chiles (either poblano, bell chilies, and/or jalapeños), made popular by the burrito chains for burritos, tacos, and quesadillas. 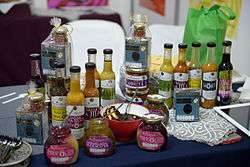 Outside of Mexico and Central America, the following salsas are common to each of the following regions; in Argentina and the Southern Cone, chimichurri sauce is common. Chimichurri is "a spicy vinegar-parsley sauce that is the salsa (and leading condiment) in Argentina and Uruguay, served with grilled meat. It is made of chopped fresh parsley and onion, seasoned with garlic, oregano, salt, cayenne chilies and black pepper and bound with oil and vinegar." In Costa Rica, dishes are prepared with salsa Lizano, a thin, smooth, light brown sauce. In Cuba and the Caribbean, a typical salsa is mojo. Unlike the tomato-based salsas, mojo typically consists of olive oil, garlic, and citrus juice, and is used both to marinate meats and as a dipping sauce. In Peru, a traditional salsa is peri peri or piri piri sauce: "The national condiment of Peru, peri-peri sauce is made in medium to hot levels of spiciness—the more chili, or the hotter variety of chile used, the hotter the sauce. Original peri-peri uses the African bird’s eye chili (the African word for the chili is peri-peri). Milder sauces may use only cayenne and serrano chilies. To a base of vinegar and oil, garlic and lemon juice are added, plus other seasonings, which often include paprika or tomato paste for flavor and color, onions and herb—each company has its own recipe. It is also used as a cooking sauce." In 2010 the CDC reported that 1 in 25 foodborne illnesses between 1998 and 2008 was traced back to restaurant sauces (carelessly prepared or stored). 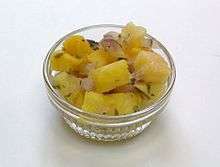 ↑ "salsa cruda - food". Encyclopedia Britannica. ↑ Gentry, Ann; Head, Anthony (2005). Real Food Daily Cookbook: Really Fresh, Really Good, Really Vegetarian. Ten Speed Press. p. 64. ISBN 1-58008-618-7. ↑ "Types Of Salsa". Thenibble.com. Retrieved 2012-07-11. ↑ "Pico De Gallo". Thenibble.com. Retrieved 2012-07-11. ↑ "Ketchup? Catsup? Ke-cap? / Whatever the name, a squirt of red can change everything". SFGate. ↑ Larry R. Beuchat. "Surface decontamination of fruits and vegetables eaten raw: a review" (PDF). World Health Organization. Retrieved July 22, 2010. ↑ Javier A. Adachi, John J. Mathewson, Zhi-Dong Jiang, Charles D. Ericsson, and Herbert L. DuPont. Annals of Internal Medicine, June 2002, Vol. 136, pp. 884–887. ↑ "Salsa and Guacamole Increasingly Important Causes of Foodborne Disease". Retrieved July 23, 2010. ↑ Ma L; Zhang G; Gerner-Smidt P; Tauxe RV; Doyle MP (March 2010). "Survival and growth of Salmonella in salsa and related ingredients". J. Food Prot. 73 (3): 434–44. PMID 20202327. 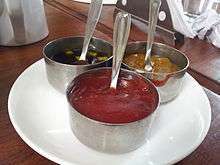 Wikimedia Commons has media related to Salsa (sauce).